In the field of nutritional science, there is no hotter nutrient than Vitamin D. Scientists are steadfastly studying the effects of D on everything from arthritis to cardiovascular disease and even psychiatric conditions such as schizophrenia. One area of particular interest is that of Vitamin D deficiency and pulmonary health. There is a desperate need to identify preventive measures and safe treatments for lung conditions because of the shockingly large number of people who are affected by them. It is estimated that approximately 300 million people worldwide suffer from asthma alone, and that number is growing at a staggering pace. 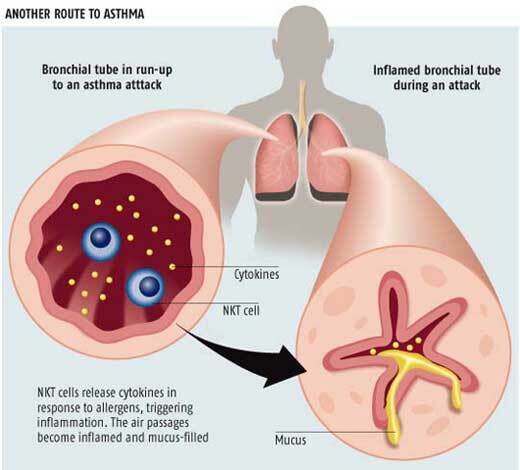 In the current laboratory experiment, calcitriol and a powerful corticosteroid were both tested on lung cells provided by 12 asthmatic and healthy volunteers. Both substances are known to possess anti-inflammatory properties. The researchers were surprised to find that the corticosteroid, commonly used to treat asthma, didn’t have much of an impact on the undesirable proliferation of the lung cells. On the other hand, Vitamin D showed a “dose-dependent” effect on the expansion of “airway smooth muscle”. These findings were so impressive that a human study in patients with severe asthma is already underway. It is expected to be completed in about a year. There is also hope that Vitamin D therapy may be useful in the management of COPD, based on its ability to reduce inflammatory substances (cytokines) that play a major role in the pathology of this disease. In May 2009, a study of 616 children in Costa Rica found a significant connection between insufficient amounts of Vitamin D and asthma. Higher levels of D were associated with a lower rate of allergies, less frequent hospitalization and “increased airway responsiveness. 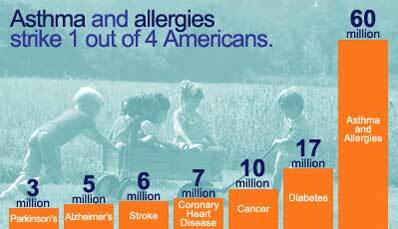 (4) The presence of allergies and asthma, as found in the Costa Rican study, is quite common. In research conducted in rats, Vitamin D supplementation has proven helpful against allergic asthma. (5) But more importantly, this trial is interesting because it analyzed children who live in a part of the world where sun deprivation is not considered a problem. Therefore, appropriate (Vitamin D) testing may be warranted even if regular sun exposure is present. The sobering data on declining lung health should be enough to make us to take notice. In order to live an unrestricted and active life, we need a properly functioning pulmonary system. Every cell in the body absolutely requires the oxygen that our lungs provide. We may not be able to do a lot about the pollution in the air, but we can use the clues that science provides in order to protect every part of the body the best way we know how. We all tend to pay insufficient attention to vitamins, but their significance for the organism is actually huge! I have personally experienced what a great force, which have the potential of vitamins, in my case, vitamin D helped to cope with chronic illness. anyone interested in vitamin D should take a look at http://www.vitaminD3world.com It has some good summaries and offers a good newsletter. I have copd and vitamin d is the best thing that’s happened to me since I was diagnosed. I’m happy to know that Vitamin D is helping you maintain good health. Wonderful news! Respiratory problems are my 90 yo mother’s weakness and she’s doing better since she’s upped her vitamin D and started sleeping on an antimicrobial Cupron pillowcase. One aggravating factor is that she’s on a proton pump inhibitor, which is known to promote pneumonia. JP, here’s an article which discusses what is a safe vitamin D blood level. It appears that any level below 200 ng/ml is non-toxic. I’m happy to hear about your mother’s success with D, Iggy. Has your mom ever tried a PPI alternative? Maybe her symptoms could be managed by using a natural alternative. Thanks for the link. It looks like a winner. Has the result of the test mentioned here been published? Did I miss it somewhere? Can you please clarify what test you’re referring to? Holist Nurs Pract. 2017 Nov/Dec;31(6):369-377. The Effect of Progressive Relaxation Exercises on Fatigue and Sleep Quality in Individuals With COPD. This randomized controlled experimental study was conducted to investigate the effect of progressive muscle relaxation exercises on dyspnea, fatigue, and sleep quality in individuals with chronic obstructive pulmonary disease. A Descriptive Questionnaire and the Chronic Obstructive Pulmonary Disease and Asthma Fatigue Scale, Chronic Obstructive Pulmonary Disease and Asthma Sleep Scale and Medical Research Council Dyspnea Scale were used for data collection. The decrease in the mean dyspnea, fatigue, and sleep scores in the intervention group was statistically significantly more pronounced than the patients in the control group (P < .05). Progressive relaxation exercises can be implemented to decrease the dyspnea, fatigue, and sleep problems seen in patients with moderate and advanced chronic obstructive pulmonary disease by nurses working in the clinic.